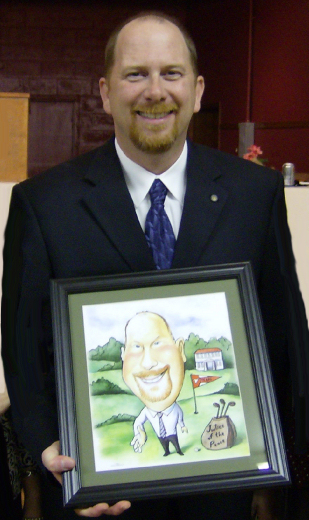 Here is a chap called Randy who was presented with a caricature as a farewell gift from his organisation. Randy’s passions are golf (if only he didn’t have to work! ), & anything to do with the University of Texas & their team, the Longhorns. He is a natural politician, the King of Schmooze, and was actually elected the youngest Justice of the Peace in Texas history (at the time). He is VERY jolly & congenial & well liked by (most) everyone he meets. Oh, Matt, that is a riot! It is SO him, especially the outstretched hand! SUCH a politician! Hi, Matt! We had Randy’s roast last Thursday night, & it was a wonderful success. Attached is the picture of the presentation, and one of Randy, the Board President & my boss (who’s also the CEO). He LOVED the caricature, & everyone there said that the artist captured him absolutely. Thanx so much for the awesome picture & fabulous service! !